Torex Semiconductor Ltd. has launched a new series of voltage regulators, the XD6216 series. The XD6216 series are positive voltage regulator ICs with 28V operating voltage. The series consists of a voltage reference, a current limiter, an error amplifier, a thermal shutdown circuit, and a phase compensation circuit plus a driver transistor. Potential applications for the voltage regulators include car navigation and audio systems, car-mounted cameras, and other automotive accessories. The voltage regulators come in a SOT-25 package. With laser trimming, the output voltage is selectable in 0.1V increments within the range of 1.8V to 12V. The output stabilization capacitor (CL) is also compatible with low ESR ceramic capacitors. Both the over-current protection circuit and the thermal shutdown circuit are built-in. 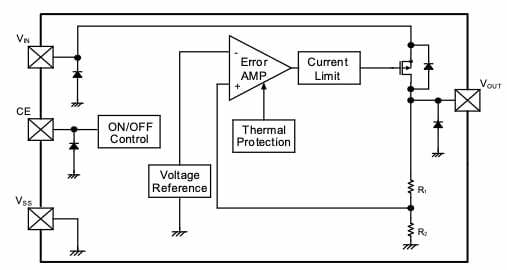 These two protection circuits begin operation when the output current reaches the current limit level, or the junction temperature reaches temperature limit level. The CE function enables output to be turned off, and the IC goes into standby mode resulting in significantly reduced power consumption. These products comply with the EU RoHS Directive and are lead-free. Block Diagram — Diodes inside the circuit are an ESD protection diode and parasitic diodes.